It never ceases to amaze me what’s achieved in some of the reader builds we feature. Just when you think you’ve seen everything, and experienced all there is in the world of sportsbikes, someone comes along to prove you wrong. Derek Kimes’ work with an XJ750 Maxim is stunning. It’s barely conceivable that the end result started with a bike that’s at best worthy, and at worst, worthless (Derek himself nearly abandoned the donor out of apathy for what was once his daily hack). And when you consider it’s the first and only bike he’s ever owned, and he didn’t have any engineering skill to call upon before, it’s even more incredible. It works and rides too: it might well be a show winner, but it’s no show pony. Brian Spencer’s TZ750 was a shocker too. 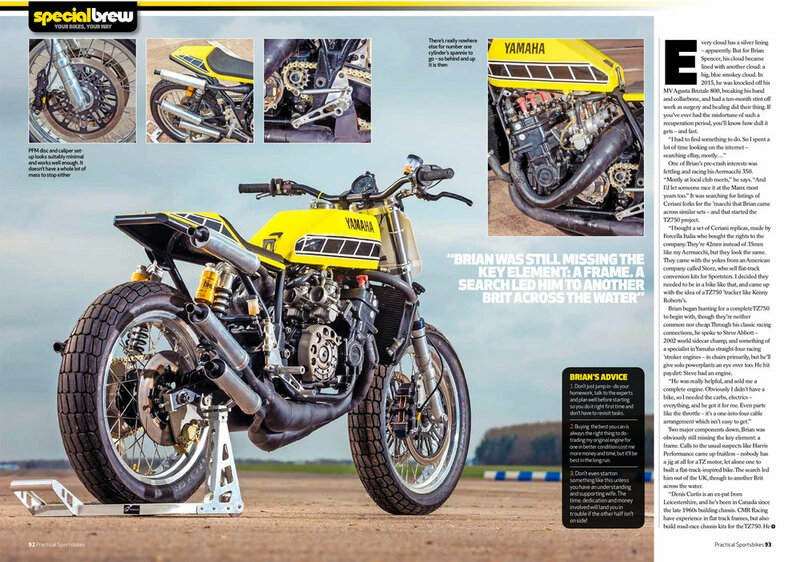 A tribute to the dirt oval two-stroke monster raced by King Kenny, I expected it to be a bit frisky, but I mistakenly thought an engine in its mid-40s might not be especially eye opening these days, compared to some of the newer, more powerful bikes I’ve tested. Not a bit of it: even in a modern chassis, it lived up to its terrifying reputation. Usually ill-manners and challenging handling aren’t a good thing, but frankly it would have been disappointing if it hadn’t resisted my attempts to control it. We’re starting on our own special build in this issue too: an engine-swapped, turbocharged ZX-7R. If we can get anywhere near the finish Derek has achieved, and the memorable experience of Brian’s TZ, then we’ll be on to a winner. For now, all we have is two less than lovely donor bikes. We best get started.